My wife and I were in need of a nostalgia fix, so we went with 10 THINGS I HATE ABOUT YOU. As we start our early 30s, I suppose it is not yet weird to want watch a teen romance comedy, especially if it is a movie you remember from your own teenage days. So we watched this again, having no idea how well the last 16 years have aged the thing. I watched 10 THINGS I HATE ABOUT YOU (1999) on 6.2.15. It was my third viewing of the film, and first in at least a decade. Based on Shakespeare’s Taming of the Shrew, 10 THINGS I HATE ABOUT YOU is a high school modernization (contemporaneously set in 1999) with little intact other than plot and some character names. The language is new, the social groups are a pure late 90s snapshot, and the story is altered in order to clean all the various storylines up in under 100 minutes. Kat (Julia Stiles) is a shrew. She’s a high school senior who refuses to date and does everything she can to alienate herself from most everyone else in school. Her sister, Bianca (Larisa Oleynik), is a sophomore who is one of the popular ones. She plays up that image and is chased by everyone from the ‘coolest kind in school’ Joey (Andrew Keegan) and the ‘new kid in school’ Cameron (the pre-action movie Joseph Gordon-Levitt). Kat and Bianca’s father has a rule that Bianca cannot date until Kat does, a seemingly impossible task, so Joey and Cameron pair up to pay off a guy to try and take her out, the Australian bad-boy Patrick (Heath Ledger). Of course, things go as they have for the last 400 years in comedies such as these scripted by people borrowing heavily from Shakespeare. The guy just doing a job falls for the girl for real, only it becomes trouble when she learns the truth. Lots of other stories swirl around this major thread and the good guys have happy endings and the bad guys get embarrassed. It’s all formulaic. That doesn’t make it bad. 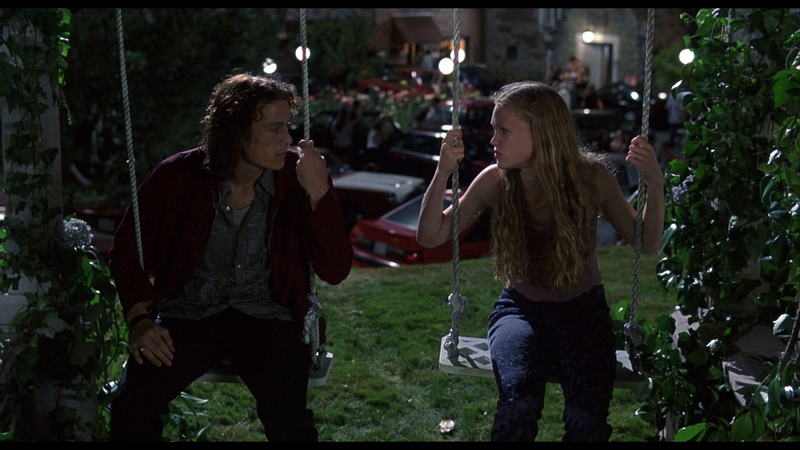 10 THINGS I HATE ABOUT YOU has highs and lows, but the performances are all decent enough. 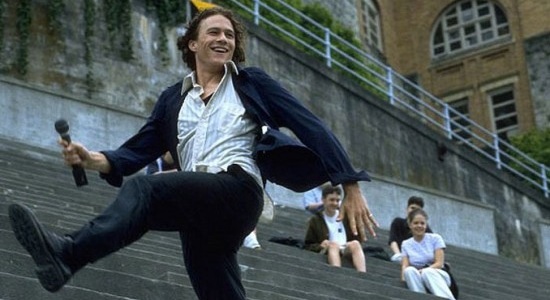 Heath Ledger singing and dancing in the soccer field audience while being chased by the cops is the sort of scene which made people fall for him as a leading man type. Joseph Gordon-Levitt had already made a career out of being the awkward kid in the TV show Third Rock From the Sun, but the schtick is welcome here. Oleynik has the thankless job of being a mostly one-note female desirable, but she finds ways to flesh it out. Stiles does everything you’d want from a leading lady in a comedy like this. On the other hand, the script is inconsistent. Proving that Tarantino influenced writers of all genres, this play sometimes sounds like a rat-a-tat-tat PG-13 romantic comedy version of RESERVOIR DOGS (without the criminals and the killing and all that). The dialogue isn’t always as clean and refined as it is in better scripts, and there is at least one awkwardly worded joke which is forced upon us for every nicely set up moment. But, because this is a movie which never stops throwing those witty lines at us, that leaves a feeling of a movie which is ultimately funny and likable. If you were to make note of all the DOA jokes – starting with the too obvious ‘girl who has a crush on Shakespeare’ plot line, you would be looking at a really long list. But if you were to make note of the good bits as well, like the awesome scene when Kat drinks too much, you’d have an equally long list. You can choose to look at this optimistically or pessimistically, and the path you choose will probably be determined by the age at which you first saw 10 THINGS I HATE ABOUT YOU. There are plenty of sneaky Shakespeare references abounding. The high school (which is a beautiful castle like structure in the Pacific Northwest that ACTUALLY IS a high school) is called Padua High School. Patrick’s last name is Verona. Cameron’s first reaction upon seeing Bianca, “I burn, I pine, I perish” is actually pulled from Taming of the Shrew. Most clunky is the aforementioned girl who loves Shakespeare plot line. None of this stuff adds to the movie, per se, but it’s fun to note as it goes along. So this is a cute little movie which holds up more than some others from the era. For late 90s high school comedies, I’ll always rank CAN’T HARDLY WAIT and SHE’S ALL THAT ahead of 10 THINGS I HATE ABOUT YOU. I’m more of a connoisseur of this era of teen comedies than I should be except, perhaps, for the fact that this was the time that I was a teen. Anyway, 10 THINGS I HATE ABOUT YOU would certainly appear in most top five lists of that genre for that time period. It is a movie which mostly earns it. I’m probably too easy on soundtracks for movies made between 1990-2005, but I love the mostly female punk rocky soundtrack from this movie, even if it isn’t always my genre. ~ by johnlink00 on June 5, 2015.